Why choose a regular bed frame when you can get additional head adjustability option at the very same price? 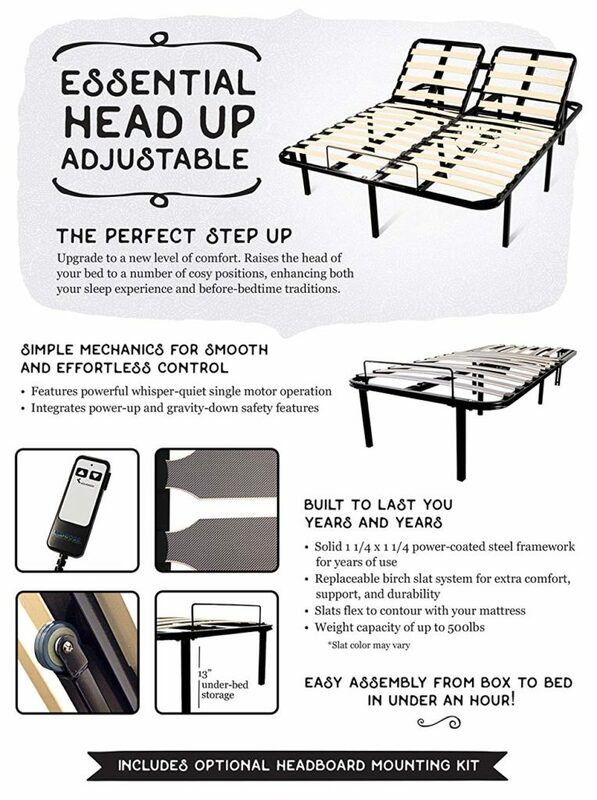 Yes, Essential Head Up adjustable bed from BedBoss looks pretty much similar to any bed frame, costs the same yet offers head adjustability through wired remote control. The head section can be raised all the way up to 60 degrees. Each motor has an overall lift capacity of 500 lbs and is absolutely noise free while performing adjustments. Made from heavy duty metal, the steel grade is meticulously chosen so that the frame lasts for several years. With one metal strip placed vertically and 13 wooden slats running horizontally, the frame supports is perfectly sturdy even when performing head adjustments. Apart from supporting all types of mattresses, employing wooden slats instead of regular metal slats also protects the mattresses in the long run. 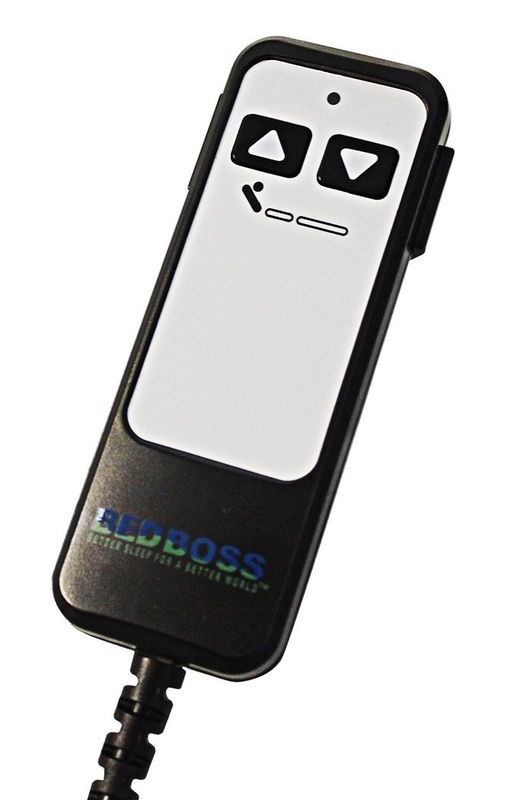 Essentials Head Up from BedBoss comes with a simple wired remote control. The two options on the remote allow you to raise or lower the head section between 0 to 60 degrees. Unlike standard bed frames, BedBoss adjustable bed is not foldable in the middle. Perhaps, this could be due to the upper frames design. 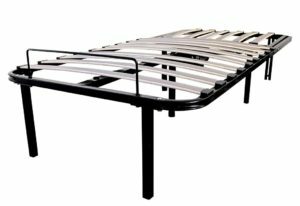 The whole frame is designed as one single unit with head section designed to be adjustable, very similar all adjustable beds on the market. The entire frame rests on 9 leg units which is a standard designed employed by most bed frames. A perfect design is to have 12 leg units which makes the frame detachable. This way they can be separately used if needed. However, 12 leg bed frames are very few in the market. As the head section is adjustable, the frame comes with a traditional mattress retainer bar at the feet level. As the feet section is fixed, the retainer bar perfectly holds the mattress from sliding downwards. 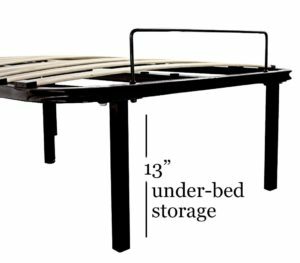 With an overall height of 15 inches from the ground, the frame on the whole offers 13 inches of under bed storage. This is ideal height from the ground level considering another 10 inches of mattress sitting on top of the frame. There are frames that stand at 18 inches from the ground but these are mostly suitable for those who are fine with low height mattresses. The entire frame is shipped in a compact box and you might another persons help to put the frame together. Although the package, weighing 99 lbs, is slightly on the heavier side but being shipped in box makes it easy carry into any room, even upstairs, at home. It might take around an hour or so for two people to put it together but frame once assembled is wonderfully sturdy. You yourself will notice the awesome built quality while assembling the frame and the wooden slats. BedBoss offers 15 years limited warranty on this Essential Head Up adjustable bed. It covers full replacement in Year-1 and on prorated basis between 2 to 15 years. If you are looking for bed frame with a storage space of 13 inches or any frame that stands at a height between 10 to inches to 15 inches then Essential Head Up from BedBoss is the ultimate choice. Costing the same like any regular bed frame, BedBoss offers head section adjustability as an add-on. Moreover, the motor installed is ultra-quiet and offers up to 60 degrees of head tilting. Finally, the frame itself is backed by a 15-Year warranty.